Granite was still fairly tempting, despite all of the aspects I don’t love about it, because — omg omg it’s so soooo soo pretty! — but at this point in the game, spending several thousand dollars — possibly upwards of 4K on 47 square feet of even the least expensive stone — would be excessive. Solid surfaces here can cost the same if not more. I still check Zillow on a weekly basis, and no one updates their kitchens around here. No one. They’d maybe slap granite on our old kitchen setup without changing anything else, but I just don’t function that way. It would be like buying silk diapers for a baby. They don’t care where they poop. You want me to put granite on that? Riiiiiight. And while I sometimes fall prey to Form’s shiny lures, it’s Function that’ll have me reaching for my wallet every. single. time. So because granite was appealing because of form to me, and not really function, she lost this round. After ruling out cement (too messy) and eco-friendly options (too expensive), I moved on to research a material I’ve seen and used plenty throughout my years of homeownership, but have never actually had to buy — laminate. I’d been putting it off because every time I went to the big box stores to ask questions, none of the counter people actually seemed to know what they were talking about when it came to this material, which is essentially plastic-wrapped plywood or particle board. But there is craftsmanship involved when it comes to measuring and cutting the substrate and adhering the decorative plastic to the top. Which is why Lowe’s and Home Depot actually hire third-party fabricators and installers to do the job. Which is probably why their sales floor employees really don’t know anything about it. Which is probably also why buying it through these stores would be significantly more expensive than just hiring someone yourself. It wasn’t until a representative from Lowe’s told me that everything — from removal of the old counters to installing the new ones — would cost upwards of $3,800, that this fact dawned on me. Let’s let that sink in for a sec. You want $3,800, Lowe’s? For laminate? Would you like me to throw in my dogs and maybe my uterus while we’re at it? You must be out of your mind. In retrospect, I suspect she might have accidentally calculated her cost based on square feet when she was supposed to calculate based on linear feet. That’s the only way to explain that exorbitant number. Either that, or the box stores just don’t like selling laminate. 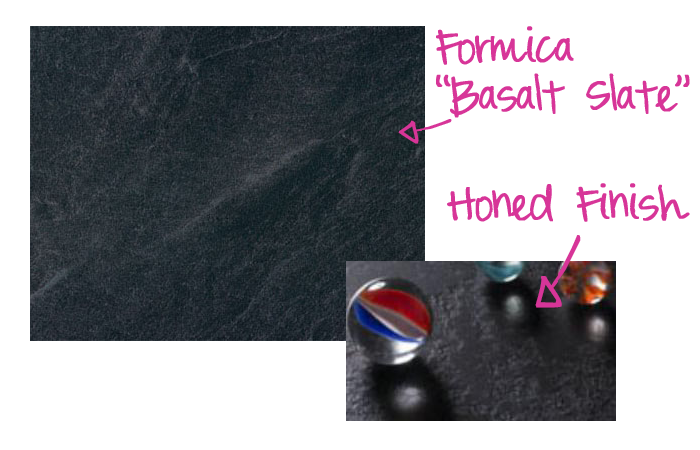 I ordered some countertop samples directly from Formica and Wilsonart (though the Formica ones never arrived, despite them telling me they’d shipped them twice), and narrowed down my choices to those in the charcoal gray family. My two favorites ended up both being by Formica anyway — Basalt Slate in a honed finish (3690-77), and Smoke Quarstone in Radiance finish (6220-RD). While the honed slate probably would’ve looked incredibly realistic, especially if I’d sprung for some fancy wrapped edges and maybe even thicker plywood, it just wasn’t worth it to spend the extra cash on such extravagance in this kitchen. So I went with the Smoke Quarstone, because SHINY. What was worth spending the extra cash on, however, was an under-mount sink. There’s just something about the luxury of wiping all of the gunk from your counter directly into the sink without that grimy, germ-collecting lip. It’s heavenly. But the idea of undermount sinks are still relatively new in the laminate industry. Obviously, since the counters are made of wood, there are special concerns when it comes to water potentially seeping through any cracks. From what I read on the GardenWeb Kitchen Forums, everyone says these are a huge no-go. But none of them actually had laminate countertops with undermount sinks. So I did a little research and found these. Armed with the proper information and questions, I gathered estimates from 3 different countertop guys I found through a series of haphazard internet searches and personal references. The first was nice and quoted me $1,880 before he even left my house, but he didn’t bring any samples or know anything about installing an undermount sink. The second was nice also, and seemed a little more professional, but I waited 4 days for his quote before receiving a text asking me to send him the number of the sample I’d liked because he hadn’t written it down. I never did get his quote or send him the sample because in the meantime, Contractor #3 had arrived, brought a bajillion samples, knew everything there is to know about laminate, could have it installed within a week, and, without knowing my previous estimate, quoted me $1,875 including the undermount sink. This third bear was juuuuust right. It sounded too good to be true. But he also collected NO money up-front, so I really had nothing to lose but time. And I’m totally used to that. Frank ended up getting my counters installed a whole day early. This is unheard of, guys, in my current world of contractor dealings. And the blurry guy is Darien. And the counters are just… well look. So far, it’s been great. I have to focus to remember that I can no longer set hot items directly on the surface, lest I cause my laminate to melt, or do whatever laminate does when you set hot things on it. If I had to admit to missing one thing about granite, aside from the sheer beauty, it would be the laying of hot things. I’m still waiting for my plumber to hook up my drains and faucet, so I can’t attest to the functionality of the undermount sink, but so far it looks even better than my old undermount with granite, which left a gross lip under the counter where gunky fungus could collect. But no such lip exists here. Overall, I’m super thrilled with this choice in the kitchen. Now we need to paint the cabinets, finish the walls, install a backsplash, and accessorize. Does anyone have any loose change? I didn’t ask about the fancy edges or upgrades aside from the undermount sink — I didn’t want to be tempted to spend more money! Frank was easy to communicate with, extremely knowledgable, and fast! Though I didn’t feel like that compromised the quality of his work. I told Frank I had a blog so I could take photos while he was doing the installation. I received zero kickbacks on the counters, and am recommending him because I’m absolutely thrilled with his work. Love my granite counters and silgranit undermount sink, but I do hate that ‘gross lip’. No gunky fungus, but hard water deposits have settled in there. 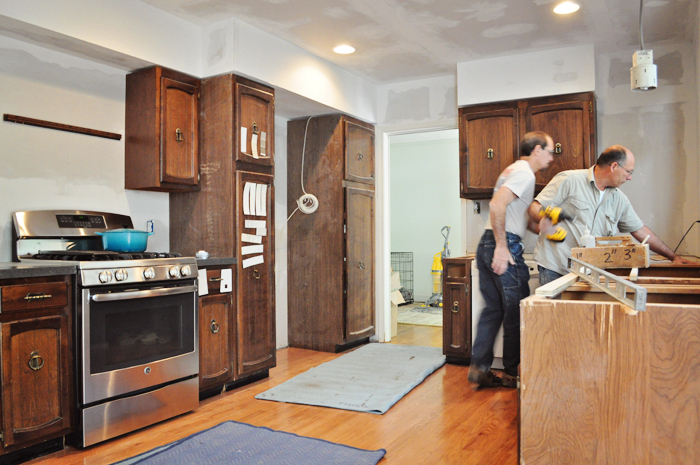 Can’t wait to see your finished kitchen! Hey, long time no see! :) A solid surface like quartz or corian would probably be my top choice if it’d been in the budget. 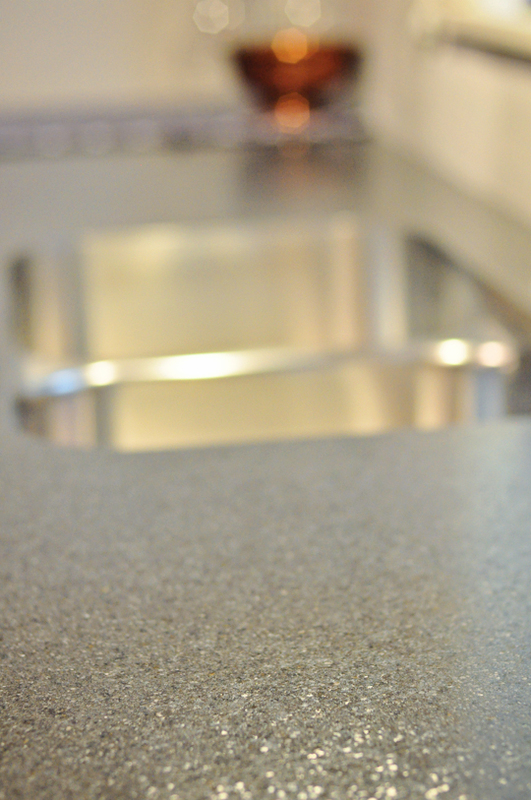 It’s definitely an incredibly practical — AND pretty — counter top material! To me, granite and butcherblock are the prettiest, but the least practical. So far I’m SO happy with this undermount sink! 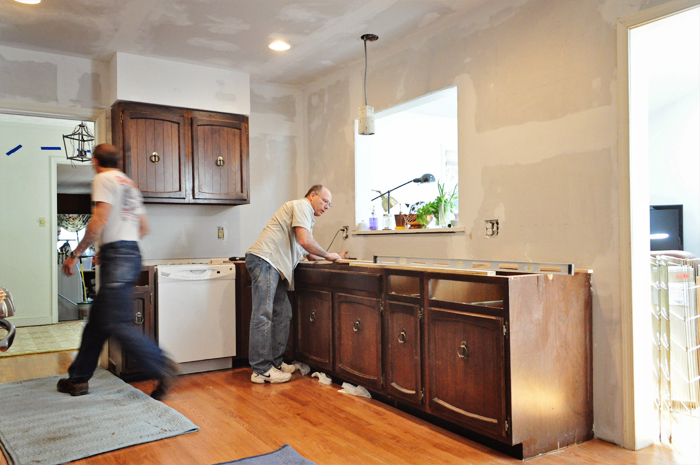 The plumber who hooked up my faucet was fascinated — he’d never seen undermount with laminate and loved the seamless look. Frank sounds like a definite hero in the construction world. Good find! I’d love to see a close-up of your undermount edge. Did he use a Karran sink? What edge? Oh he IS! I was absolutely thrilled — I’d recommend him to anyone. EXACTLY about granite and laminate. 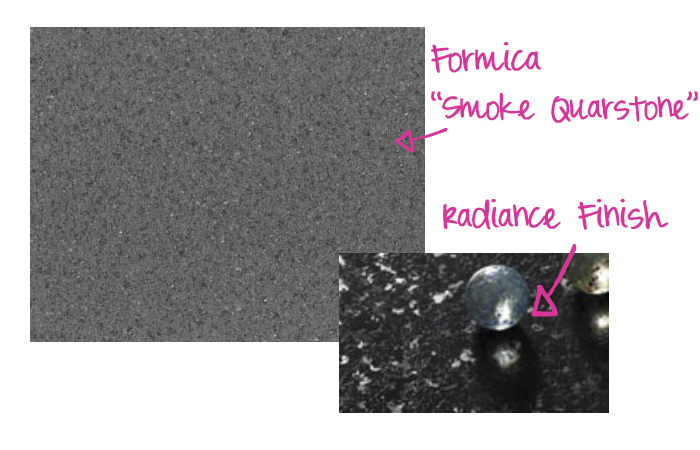 Granite is stunning, but that’s really the most it has to offer in the world of counter tops (and the heat resistance). I’ll have a post coming up soon about my new faucet, and I’ll be sure to include some pictures of the edge of the sink. It looks closer to an integrated sink you see in solid surface counters than an undermount sink you’d see in granite. There’s NO lip — it’s just right there on the edge. I love it! The sink is Karran — he just provided it so I don’t know about the edge. It’s the kind made specifically for laminate undermount. I wasn’t particular about it — just went with the cheapest option and it’s great, especially with my new faucet! Thanks. I looked at the gallery on the Karran site you linked, and there are different edges, including some with the classic undercount look, and some with the look I thought you were describing. I’ll look forward to more pics! I think the ones they show with the classic undermount look are the ones that are attached to granite or solid surface. The ones that look completely integrated are attached to laminate counters, because laminate can’t have that substrate exposed (so essentially the sink has to be mounted right up against that top plastic layer). It looks like this edge or the 3rd and 6th ones down in the gallery. Thanks again. I thought maybe they had trim that covered the edge of the substrate, but, honestly, I didn’t look very closely! btw, what are you doing for backsplash? what tile sites have you looked at? We have sat without backsplash for 3.5 years (waiting for Justin and his tilesaw??? just kidding) and now want to finally finish. I’m thinking of autumn slate 4×4. But looking at tile and designs is overwhelming…. So this is totally out of my realm of knowledge, but I do have to say they are pretty! I would also miss the casual laying out of hot things, but what can you do. Glad you managed to find Frank! 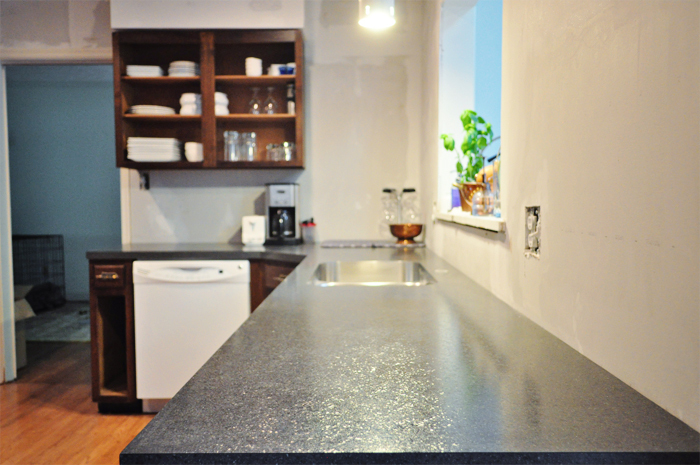 Katie – I stumbled upon your blog during a websearch of countertops and I have to say – your kitchen looks fantastic! 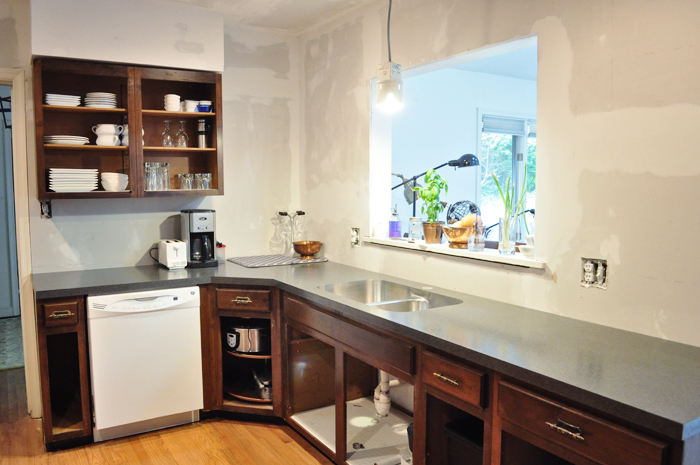 I look at the page showing your countertop decision and think…that’s exactly how our kitchen looks right now. Cabinets without doors or drawers, partial lights.. 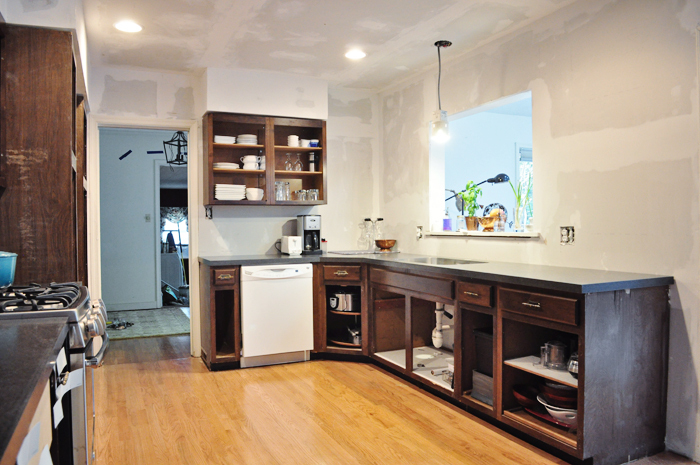 In your kitchen I wonder how your undermount sink is holding up? I ask because I am currently in the process of building the exact same sink into the exact (though matt finish) Smoke Quarstone countertop. In particular how the very edge of the sink-to-formica is holding up. Your’s looks so sharp and I hope ours turns out close to yours. Hi Elia, it looks great! (I’m on vacation – sorry for taking so long to respond.) The sink is holding up fine, though there is a tiny seam next to the faucet that looks like it’s opened up a bit, but I think it’s because the plumber screwed the faucet in too tight. The seams around the sink itself are perfect – even better than granite undermount because there’s no place for gunk to build up! I’d do it again. Hi, Katie. Your kitchen looks great. 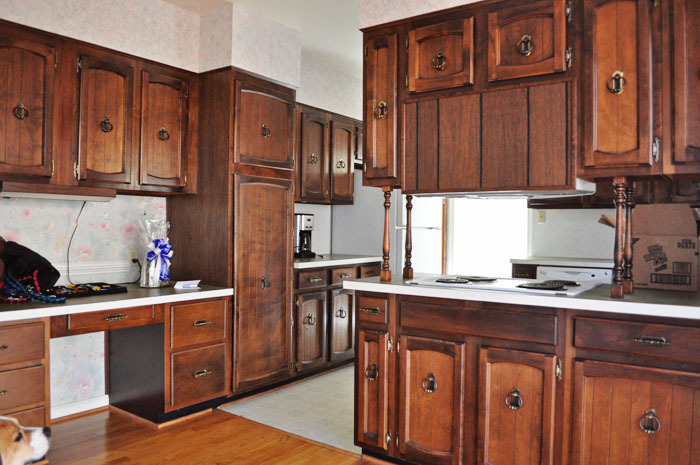 I’m thinking of using another radiance finish for my mom’s 70s kitchen. Do you find that the little nooks and crannies pose a problem for cleaning? I have read someone claim that it was a real pain to clean after rolling dough on it or anything thick liquid (soup?). Also, how’s the dark color holding up? Some installer say they show scratches more easily but maybe that’s not an issue with the textured finishes. Hi Amanda, apologies for taking so long to reply! I had a baby right before you left your comment and I haven’t been back to the site much. To answer your questions, the laminate we chose doesn’t really have any nooks or crannies. I suppose it’s not completely smooth, but I’ve never had an issue with cleaning it. It wipes up in a snap! In fact I think it’s easier to clean than the granite we had in our last house, which often felt gritty and seemed to absorb liquids.